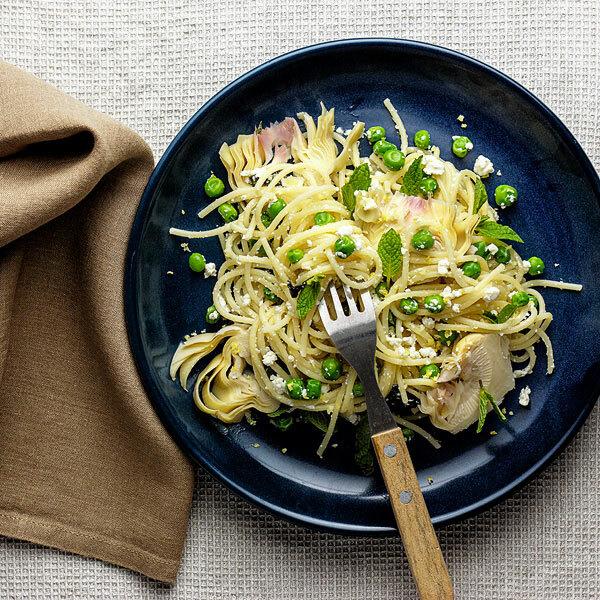 Use any pasta to make this simple, summery recipe. This is more of an assembly job than it is cooking. You cook the peas in the same pot as the pasta for the last three minutes and, once they're drained, simply toss everything together. It's an easy, cool option for a hot summer’s day, or any day when you want fresh flavour fast. Use whatever pasta shape you prefer, short or long. The short pasta option is great if you want to chill it and eat later as a pasta salad, and it makes great portable lunch to take to work. Cook the pasta in plenty of salted, boiling water for the time recommended on the packet. Three minutes before the pasta is done add the peas to the same pot – then they will both be ready together. Drain in a colander. Slice the artichokes thickly and place them in a roomy bowl. Add the mint, roughly chopped if the leaves are large, and crumble in the ricotta. Tip the drained pasta and peas in with the other ingredients, add a tablespoon of olive oil (or oil from the artichokes' jar) and season with salt and pepper. Give everything a quick toss and you’re done.